Betty and I bought a Groupon voucher to The Junction Kitchen & Bar way back in January of this year. We had planned to go on a Saturday night. Thus, I called in to make a reservation. I called in earlier in the week but there was no one that picked up the phone. I found it a little odd and then called again on the Saturday that we were going to the restaurant for dinner. Again, no answer. The restaurant was closed on the Saturday night that we wanted to go! A few days after that, we tried for dinner again and this time, I called the restaurant once more to make a reservation. This time, a man picked up and when I told him what had happened the other night, he was quite rude and blunt and told me that their restaurant had closed for a private event that night and that’s why they were closed. Um, but the restaurant was completely dark and empty and there were barely any cars in their parking lot when I was there that Saturday. This was extremely uncalled for and his rude tone on the phone didn’t give me any other good impressions of the restaurant. Since we had bought the Groupon though, I was still willing to go and use it up and try their food. The Groupon voucher was bought for $31.20 (it was originally $39 but there was a discount when I bought it) for a three-course meal for two people. We were allowed to choose a starter to share (for up to $14), two entrees (for up to $50), and a dessert to share (for up to $14). We finally were able to make it to the restaurant successfully! Betty had called into make a reservation for us on a Saturday night in April (can’t believe that it took us three months to finally get to dine at this restaurant; our schedules were also very busy to accommodate) for 6 p.m. When I got there, we were one of the only two guests in the entire restaurant. I had underestimated how big the restaurant would be from the outside. It was huge inside! 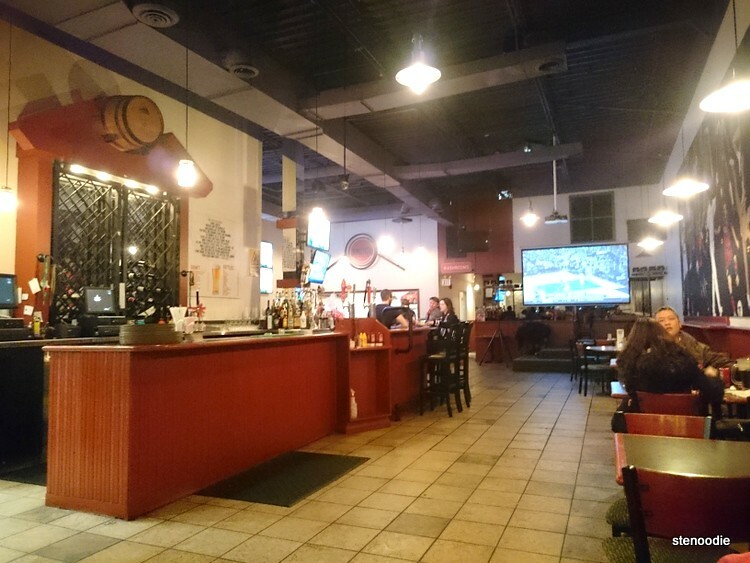 It was a full sports bar and restaurant with ample tables and room at the bar for food and drinks. 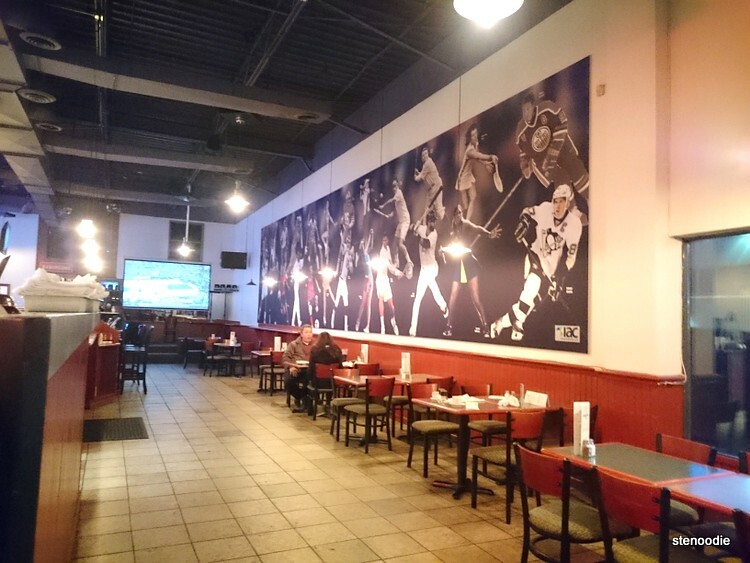 They also had an area with a pool table too and flat-screen TVs for sporting events. There was one server at the restaurant serving us that night. He was incredibly friendly, polite, and accommodating during our visit. It was nice. 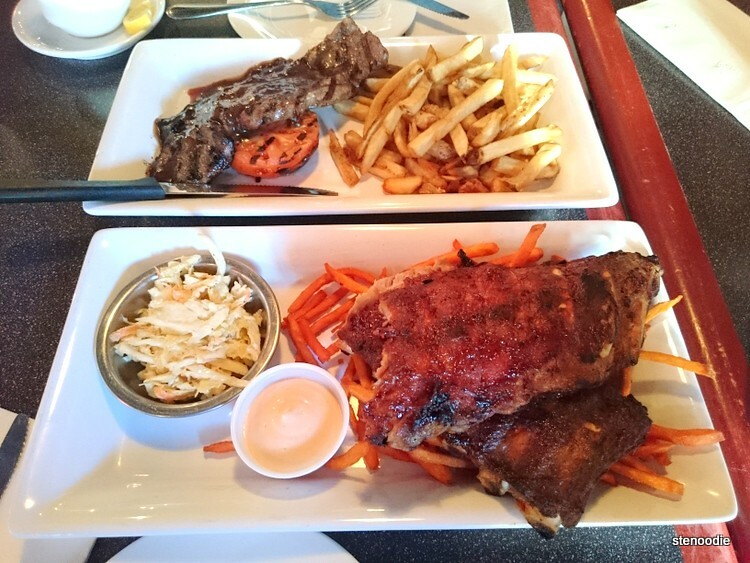 We chose the Pepper Shrimp starter to share, Steak and Fries and the Baby Back Ribs (full rack) with sweet potato fries, and the Brownie Cheesecake to share. When ordering, the server didn’t inform us that the sweet potato fries would cost an extra $2. If we had known this before it came to bill time, I wouldn’t have chosen the sweet potato fries and opted for the salads instead — I didn’t want to pay extra fee for fries. What a cool canister to carry the hot water! 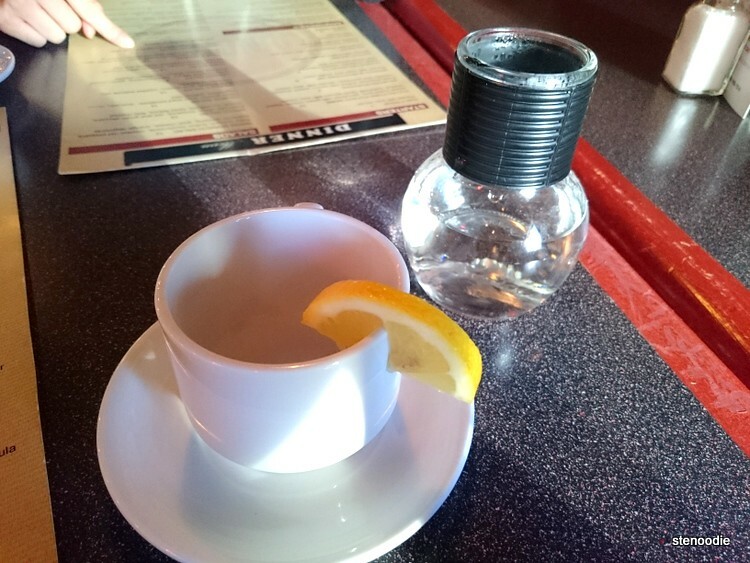 We asked for hot water with lemon as our beverages and I was fascinated with the hot water containers that came along with our mugs. It looked like a light bulb! It was really cute. Our food arrived in a reasonable amount of time and gave us lots of time to catch up and chat during dinner. The Pepper Shrimp arrived in a nicer presentation than I expected considering it was a sports bar. 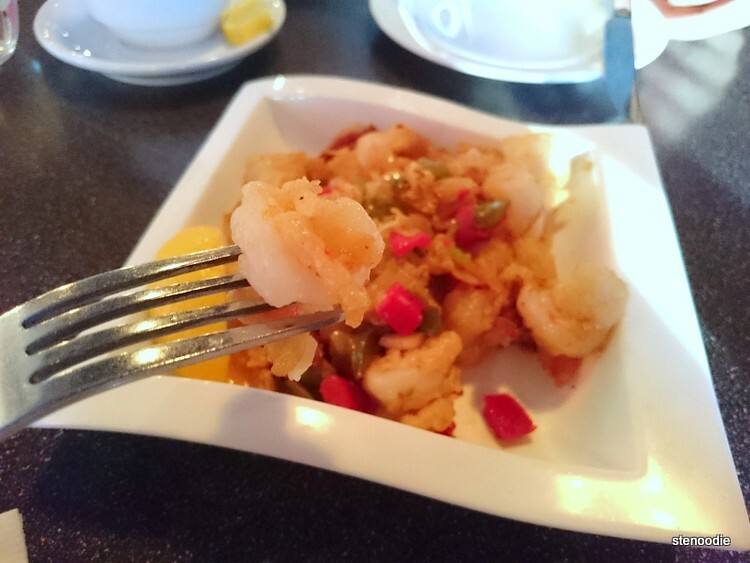 The deshelled shrimps were very lightly battered and stir fried with lots of peppers. At first bite, the shrimp was incredibly tender and fresh. After chewing it, that was when you noticed the spice kick in. The dish had an incredibly Asian sensation to it. 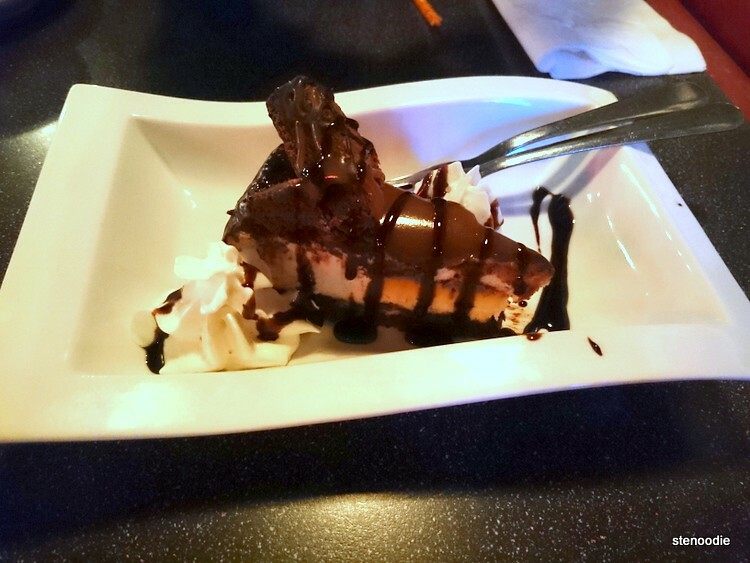 It didn’t seem like something you would eat at a sports bar at all. It really did seem like a stir fry dish you would have at a Chinese restaurant. It was quite an interesting starter. 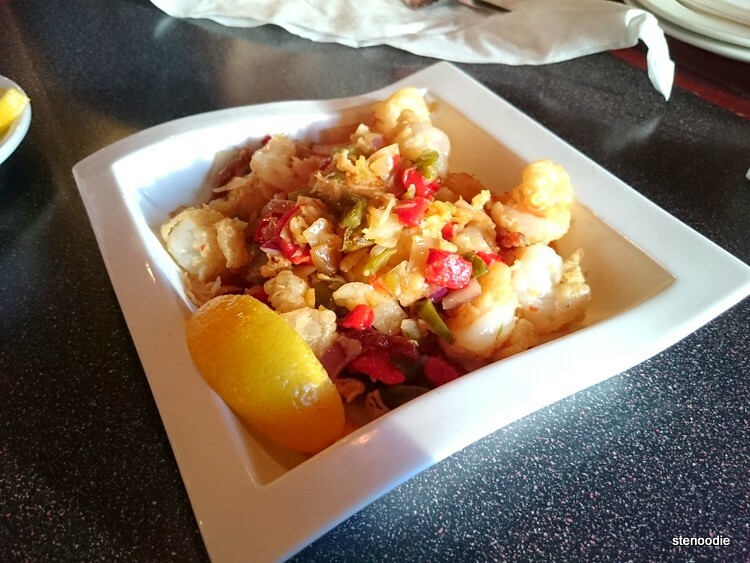 I thought that the fresh crisp shrimps didn’t really match the spice of the peppers. The Steak & Fries arrived with some regular potato fries on the side. The steak was a flat lean steak that was definitely overcooked. 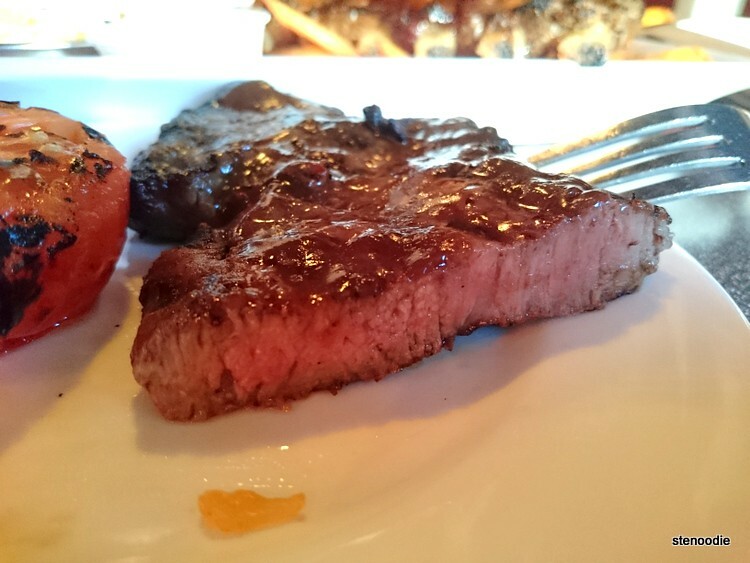 We had asked for medium rare but the inside of the steak was all cooked through. Hmm… I informed the server of this too when he asked how our food was and he apologized for the overcooked steak. The steak itself was decent tasting. There was also a grilled tomato on the side that was heavily charred. I had to scrape off the burnt bits but the tomato itself was delicious — it was so juicy! The coleslaw was a good combination with the ribs. The baby back ribs were actually delicious! There was just enough sauce on the ribs and it was tasty. It also was a little over-grilled though but it take away from the overall taste. It was a lot of food for me and I ended up packing up my share to enjoy later at home. 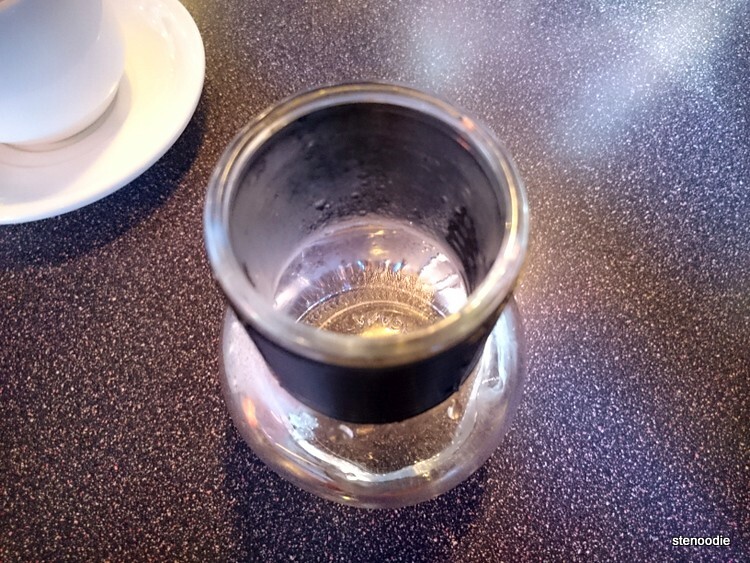 Overall, I was glad that we finally got to try The Junction Kitchen & Bar. I would say that their food were hits and misses. The dessert and baby back ribs were very good but the starter and steak could have been executed better. I was also a little concerned for their business seeing as there was such a lack of customers on a Saturday night. Perhaps they are very busy during weekdays for lunch with so many corporate buildings around them though — what do I know haha. 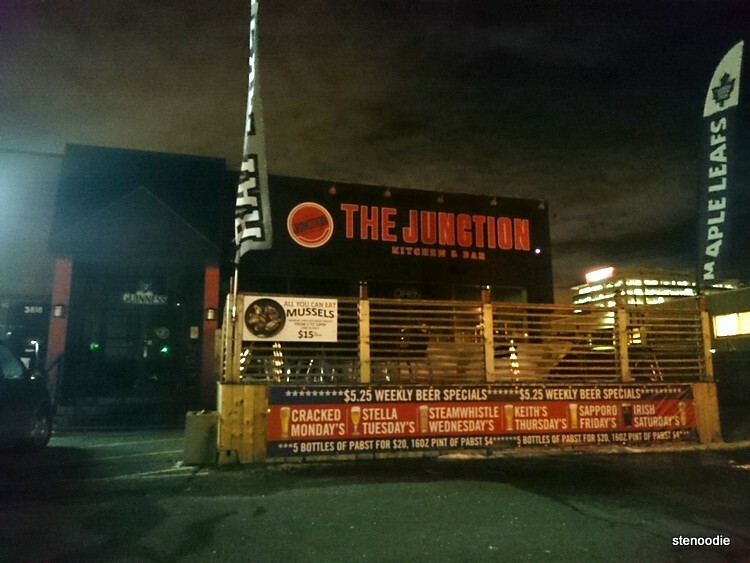 Have you been to The Junction Kitchen & Bar before? What was your experience like? 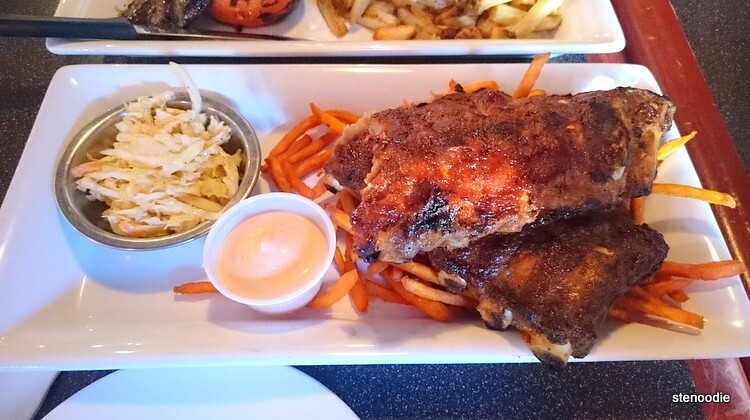 This entry was posted in Food and tagged 3820 Victoria Park Avenue, @TheJunctionTo, Baby Back Ribs with Jack BBQ sauce, Bar Food, coleslaw, dinner at the Junction Kitchen & Bar, food blog, foodie, Junction Kitchen & Bar groupon, Markham pub food, North York, Pepper Shrimp, restaurant review, Scarborough, Steak & Fries with fries and grilled tomato, sweet potato fries, The Junction Kitchen & Bar, The Junction Kitchen & Bar reviews, Toronto. Bookmark the permalink.